We’d love your help. 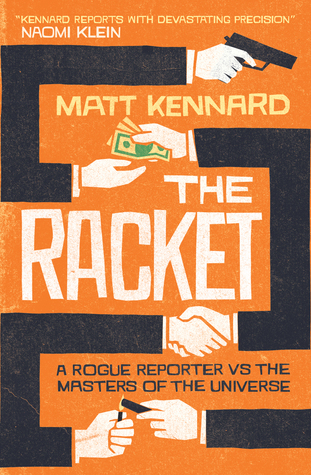 Let us know what’s wrong with this preview of The Racket by Matt Kennard. The story Americans are wont to tell themselves about their nation is a compelling one: the United States is a force for good in the world, a haven for prosperous upward mobility, and a stalwart defender of democracy and human rights abroad. With The Racket, veteran investigative journalist Matt Kennard pulls back the curtain and reveals a much darker truth. The picture of The story Americans are wont to tell themselves about their nation is a compelling one: the United States is a force for good in the world, a haven for prosperous upward mobility, and a stalwart defender of democracy and human rights abroad. With The Racket, veteran investigative journalist Matt Kennard pulls back the curtain and reveals a much darker truth. The picture of America he paints is radically at odds with that noble image: through Kennard’s eyes we see another America, one that has lashed the world to a neoliberal vision and has rewarded wealthy elites at the expense of ordinary people, genuine freedom, and the global environment. Building his case from more than 2,000 interviews with officials, intellectuals, and artists around the world, Kennard reveals how we are sold a dream and how that dream obscures the reality of the corporate state, mass incarceration, and the evisceration of human rights. To ask other readers questions about The Racket, please sign up. Kennard's story could be 'the greatest story never (before) told'. The beans he spills on how big business and American political hegemony controls everyone else are painful, perhaps eye opening and certainly disheartening. The Bretton Woods institutions, if not designed as such, quickly became vehicles for projecting American hegemony across the world. In economies where the IMF and World Bank are not dictating the Washington consensus, they and the global, to a large extent American, business e Kennard's story could be 'the greatest story never (before) told'. The beans he spills on how big business and American political hegemony controls everyone else are painful, perhaps eye opening and certainly disheartening. The Bretton Woods institutions, if not designed as such, quickly became vehicles for projecting American hegemony across the world. In economies where the IMF and World Bank are not dictating the Washington consensus, they and the global, to a large extent American, business elite, subvert those economies until they have no choice but to fall over and accept dictated terms. Or, as an alternative, they wait until some disaster, say an earthquake, allows them to step in and create neoliberal economies that benefit outsiders, as opposed to the indigenous population. Kennard jumps from narrative to narrative, perhaps a bit too much, and would benefit from being more concise, but the sheer scope of the global cabal he describes, means that virtual all countries outside of Europe have had to face, and almost always lose against, 'The Racket'. The Racket is opportunistic, looking out for their own, ready to sacrifice the well being of unnamed millions for their own benefit. And, having honed their skills, they have perfected their methodology, getting away with it time and again, even when their plans, time and again, turn out to be the social failures, if big-business successes, that create the likes of Iraq. It's not a stretch to discuss Israel as a client state of the US in this context, as Israel is an important extension of American foreign policy and thus business interests. Israel only became of strategic interest after Arab client states started to became more independent, or turned more towards the Soviet Union, specifically from the late 1960s onwards. Amazingly, American 'aid' to Israel has added up to more than 23000 USD per living Israeli citizen. Kennard also spends time on the few cases where the US, and The Racket, have found some pushback. Notably Venezuela, Bolivia and the Zapatista movement in Mexico, while praising the Latin American shift to the left. Yet, though Bolivia is still managing, Venezuela has become a mess, not in the least due to result of American policies, while much of Latin America has swung to the right in the last two years, typically by big media and big business being able to subvert truth, projecting a fantasy, any fantasy, as reality. Almost a footnote at the end of the book, Kennard points out that 'the racketeers are genuinely afraid of the creative arts', as artists exist outside of the conventional system and don't have to follow the narrative, and can not easily be controlled. They therefore have more freedom and thus are more of a risk in overthrowing the system. Having read two other books by another journalist turned writer, Jon Ronson, I got the wrong impression that these type of investigative works should be more or less objective. I agree on some of the presented facts and some of the argumentation and the fact that the US government, Wall Street and insurance companies - the "racket -" have unscrupulous interests that they chase using underhanded methods is undeniable. However, I'm giving this book a low rating for the following reasons. The autho Having read two other books by another journalist turned writer, Jon Ronson, I got the wrong impression that these type of investigative works should be more or less objective. I agree on some of the presented facts and some of the argumentation and the fact that the US government, Wall Street and insurance companies - the "racket -" have unscrupulous interests that they chase using underhanded methods is undeniable. However, I'm giving this book a low rating for the following reasons. The author has leftist inclinations and this is strongly reflected in his work, there is blatant leftist propaganda which makes me, as citizen of a former communist country, sick to my stomach, leftist presidents like Hugo Chavez, the former cocalero (coca leaves picker) Evo Morales, Salvador Allende are praised and presented as brave heroes who fought against the "imperialist" America. Hugo Chavez is lauded that he built a modern and clean metrocable up the hills of Caracas but the author doesn't mention one iota about the decrepit state in which he left the country, there are food shortages and even toilet paper is hard to find, the author can't see the forest because of the trees. Salvador Allende is presented as the poor communist president that was ousted by the dictator Pinochet and the author wrongly writes that what followed next was decades of economic downturn; Chile is an example of economic development and stability in South America and it's all due to the reforms done by Pinochet, if Allende remained into power than most probably Chile would be nowadays in the same decrepit state like Venezuela. The author invents or omits important historical facts, for example he writes that the US got Cuba from Spain in 1852 which is a pure invention, this event never happened. Highly recommend. Very insightful analysis on how Big Business and America government topple governments that don’t roll out the red carpet and comply with their exploitative money making capitalist program. If you want to know how and why the USA runs almost the whole world this is the book for you. Luckily there is also hope for a better future free of the neo liberal chains the world on whole is in. Matt writes this is if he has discovered something new. Well he hasn't. Eye opening to the say the least. If you have a passing interest in World Politics, Capitalism, US Foreign Policy and how they make an impact and change various parts of the world for the worst and in detriment of the local people give it a chance and get informed.